A 7.2 magnitude earthquake struck Mexico at 11.39pm Irish time last night. A 7.2 MAGNITUDE earthquake that has rattled Mexico triggered a tragedy when a minister’s helicopter killed 13 people during a crash-landing on the way to the epicentre. The UH-60 Black Hawk military helicopter landed on its side, crushing a van. The chopper was carrying Interior Minister Alfonso Navarrete and Oaxaca state Governor Alejandro Murat, who were unharmed, President Enrique Pena Nieto said. “Unfortunately, multiple people on the ground lost their lives and others were injured,” he wrote on Twitter. The Oaxaca prosecutor’s office said five women, four men, and three children were killed by the helicopter, while another victim died en route to the hospital. Fifteen other people were injured, the office said in a statement. Rescuers quickly swarmed the accident site searching for survivors. Navarrete told the Televisa TV network that the helicopter pilot lost control of the aircraft about 40 metres above the ground as it was coming into land. He added that some passengers were hurt. The helicopter went down in the southwestern town of Pinotepa de Don Luis – 37 kilometres from the quake epicentre, according to the US Geological Survey. About 50 homes in the nearby town of Santiago Jamiltepec were damaged, as well as the town hall and church, but no one was killed in the quake, the interior ministry said. Oaxaca state authorities opened shelters for those affected, and nearly 6,000 soldiers and federal police were deployed to help with the emergency response. Both Mexico’s National Seismological Service and the US Geological Survey put the quake’s magnitude at 7.2. It struck at 5:39pm (11.39pm Irish time) yesterday evening at a relatively deep 24.7 kilometres, said the USGS. The earthquake came less than six months after two quakes killed hundreds of people in the country. On 7 September, an 8.2-magnitude earthquake shook the nation and killed 96 people, mostly in the states of Oaxaca and Chiapas. Then on 19 September – the 32nd anniversary of a 1985 quake that killed 10,000 – a 7.1-magnitude quake hit the country, leaving 369 people dead. Yesterday’s quake triggered Mexico City’s alarm system and caused buildings to sway in the capital. It was also felt in the states of Guerrero, Puebla and Michoacan. Panicked residents flooded the streets, fearing a repeat of last September’s deadly quakes. “To be honest, we’re all pretty upset. 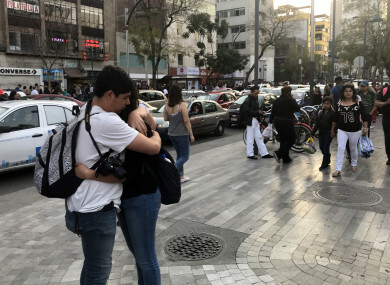 We start crying whenever the [earthquake] alarm goes off,” 38-year-old publicist Kevin Valladolid told AFP through tears after fleeing his building in La Roma, in central Mexico City. We’re stressed out, we have flashbacks. So we run out into the street. It’s all we can do. Patients from a nearby hospital were forced outside, some in wheelchairs or carting their IV lines. Similar scenes played out in Veracruz. On the north side of Mexico City, Julia Hernandez said she felt like she was “in a boat” as the ground swayed beneath her feet. “Is it ever going to stop?” she said. Standing in the middle of the street, her eyes glued to her fifth-floor apartment, Graciela Escalante, aged 72, could hardly speak. “It was terribly strong. We barely managed to get down the stairs. It was the longest staircase in the world,” she told AFP. Officials in affected states said they were inspecting buildings damaged by last year’s quakes, which are especially vulnerable to collapse. “Obviously people are afraid,” said the emergency response chief for the city of Puebla, Gustavo Ariza. Pena Nieto tweeted that the National Emergency Committee had been activated because of the magnitude of the quake. Email “13 killed after helicopter crashes as it made way to Mexico earthquake epicentre”. Feedback on “13 killed after helicopter crashes as it made way to Mexico earthquake epicentre”.